Like most tween boys, my oldest son is a Lego fanatic. 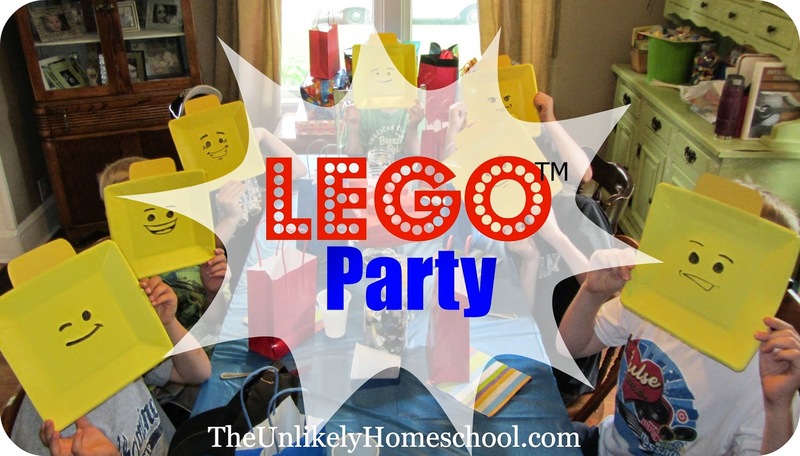 So not surprising, when asked how he wanted to celebrate his birthday, he only needed a nano-second to request a Lego-themed bash surrounded by family and friends. Right about this time, my daughter had been learning to make stop-motion videos with a stop-motion app on our iPad. I was quick to enlist her services to make an invite to the party which we sent to all the party guests. I love throwing kids parties! I love the games. I love the crafts. I love the smiling faces of the party guests as they leave with a belly full of cake. So, what's a "decorating's not my thing" momma to do for trimming a party on a shoestring, debt-free budget? Spend a late night scouring her Pinterest boards for some DIY Lego decor! That's what. 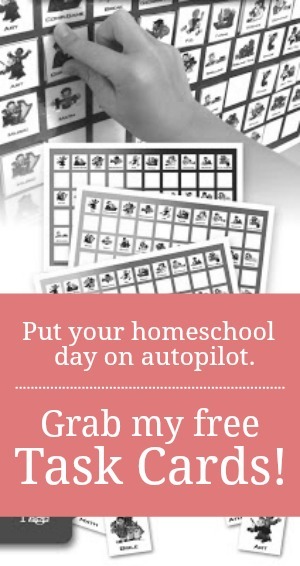 Click on the highlighted titles to see the original ideas on Pinterest. My artist-husband jazzed up some square/yellow Dollar Tree plates by using a Sharpie to add Lego mini-fig faces. I glued some yellow cardstock to the top to make the classic Lego man nubbin. 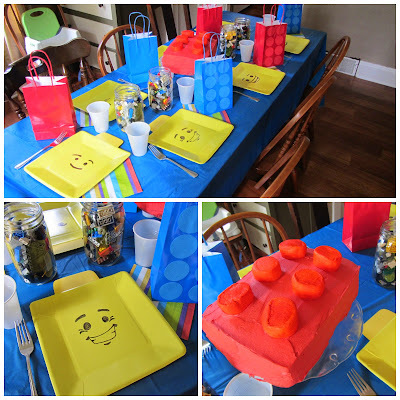 A simple circle cutter and some cardstock turned a pack of blue and red gift bags into Lego pieces stuffed with party treats. I lined a handful of Lego-filled Mason jars down the center of the table. I had planned to also sprinkle some Legos around the jars, but my library-table-turned-dining-room-table is super narrow and was getting a bit too crowded for any more bling. Super Boy was VERY specific about how he wanted me to make his cake. He wanted a 2 x 3 brick. Red. So that's what he got. 2 rows of 3 pegs. This was just a 9 x 13 sheet cake. I cut the cake in half and then sandwiched the two pieces together with some frosting. The pegs were made by cutting super huge marshmallows in half and painting them with a water/food-dye wash. In case you are wondering, I did not let anyone eat the marshmallows. I think all that dye and fluff would have put them all into sugar shock! Pass the decor off to Pinterest, but leave the game-planning to me! It's my favorite part of organizing a kid's party. Here's a quick look at our fun. During our pre-party prep, I had The Hubs place a handful of very distinct Lego pieces onto a Lego mat. He also found several EXACT matches to these pieces...some of the mat pieces had several duplicate matches while others had only one match. He tossed all of these matches into a big bin of random Legos. At the party, he showed the party guests the Lego mat filled with the previously selected Legos while I handed each guest a plastic cup. I dumped the bin of Legos out onto the carpet and spread the pieces around the room. On my "go", the game players had to find as many EXACT matches as they could and place them in their cups. The person who collected the most pieces that matched those on the Lego mat won! Since two of the pieces on the mat only had ONE match in the entire tub of Legos, we awarded the finder of each of those pieces an extra 5 points to be added to his/her final total. Since the floor was already covered with random Legos, it was really easy to transition into this car race game. During our prep, we had previously gathered some core car building parts...wheels, small flat mats, mounts, etc. We placed these in one part of the room and allowed the kids to use these to make the base of a car. 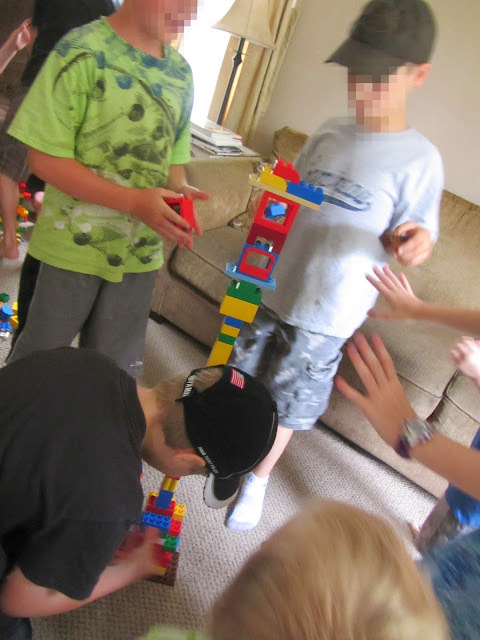 They, then, had five minutes to add the "scattered about the room" Legos to their base to create a one-of-a-kind racing car. Once all the cars were complete, we took them outside where The Hubs volunteered to hold an old rain gutter on his shoulder to act as a racing chute. One at a time, the party guests lined their cars up in the gutter. Each car was released and rolled down and out of the gutter onto the sidewalk. The player whose car rolled the farthest down the sidewalk won. Even after the creation of all those racing cars, there was still an enormous heap of Legos scattered all over my living room floor. The final game of the morning took care of that in a flash. I handed each party guest a cup and a plastic straw. On my "go", they each had to pick up as many Legos as they could and drop them into their cup. They could only touch the Legos with the tip of their straw. By squeezing the straw into the holes on the back of the pieces, the kids were able to pick up one piece at a time. The person with the most Legos in their cup at the end of the "clean up" won. Oh my gracious, this party looks like such a great time! All of the decor, and games are fantastic! 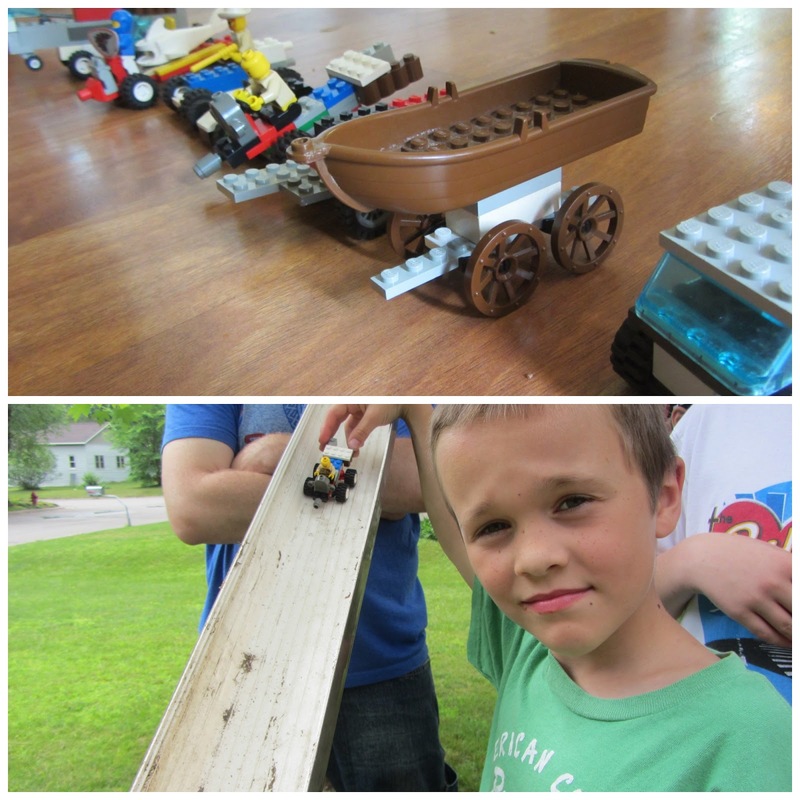 I have a lego fanatic as well, and I see a couple of ideas that would make him super happy! Thanks for sharing! So glad it was helpful, Lindsay! 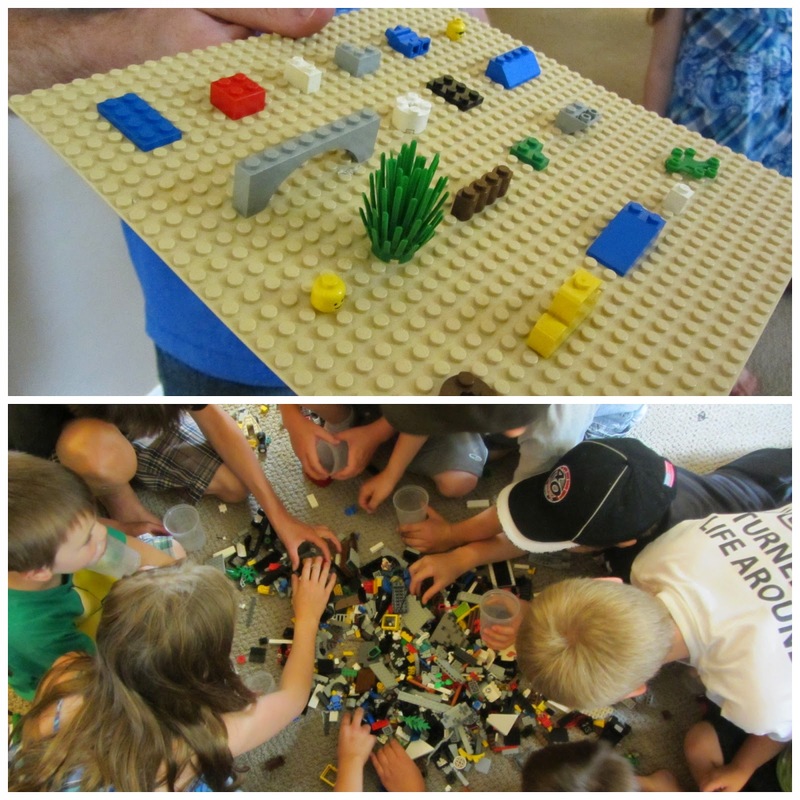 I hope you and your Lego fanatic enjoy some Lego fun together. I just showed this to my six year old. He said he can't wait til his birthday in October. Love this idea, because it's doable without killing the pocket book. Thanks for sharing! You're welcome, Sheri! So glad to know we have a mutual friend. I'm glad she introduced us. What a great party! After using a Sharpie on the plates, they were still safe to eat off of? That's my only concern. My 10, almost 11 year old would love this party. He adores Legos - even went as a Lego brick for Halloween two years ago. Good question. Not sure of the answer. You could always put a piece of wax paper down over the face when it was time to eat.